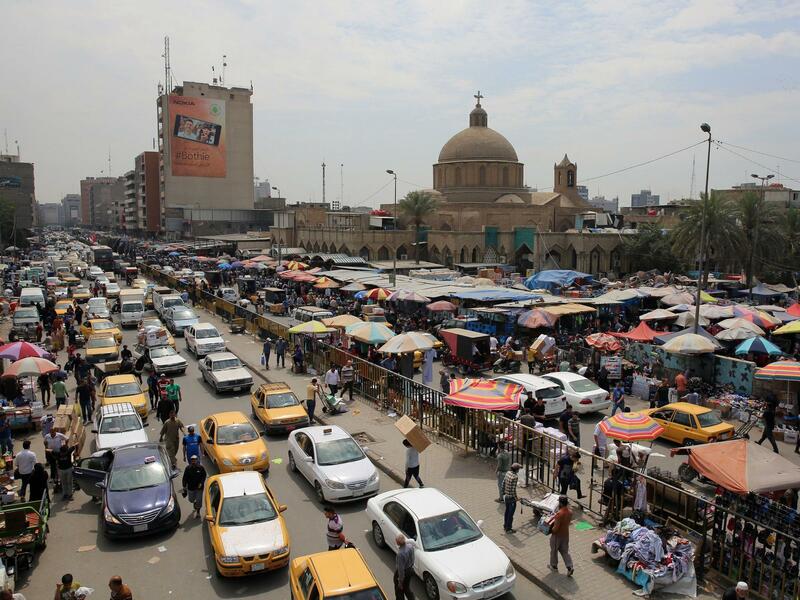 The Shorja market in central Baghdad, bustling in early April, was targeted in attacks in 2007. 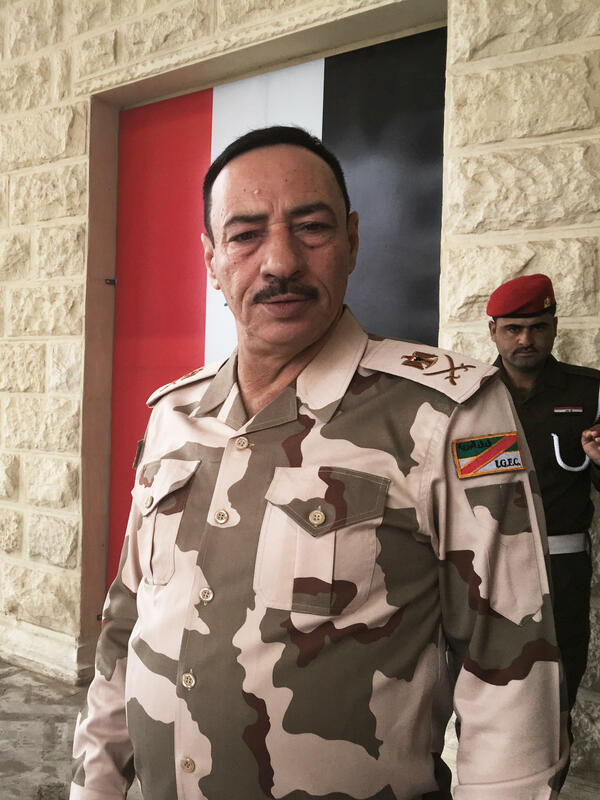 Gen. Nijm al-Jabouri at Saddam Hussein's former palace compound in Mosul, where he is in charge of Mosul security. In 2003, he thought the new Iraq would be orderly, liberal and secular. "We thought we would breathe freedom, we would become like Europe," he says. Instead, he says, "We returned to the Dark Ages." U.S. soldiers take cover near a portrait of Saddam Hussein while conducting a sweep of the VIP terminal of Baghdad International Airport on April 4, 2003. 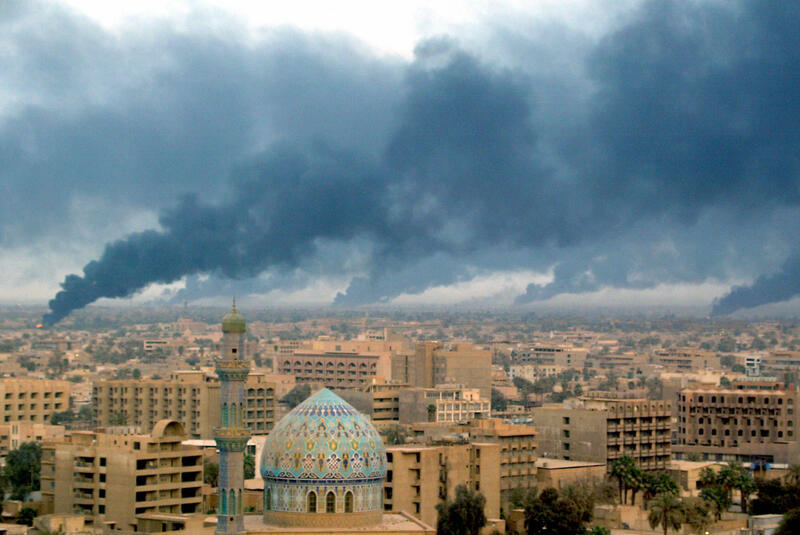 Smoke billowing from burning oil trenches covers Baghdad on April 2, 2003. Fifteen years after the U.S. invasion, electricity is still unreliable in Baghdad. 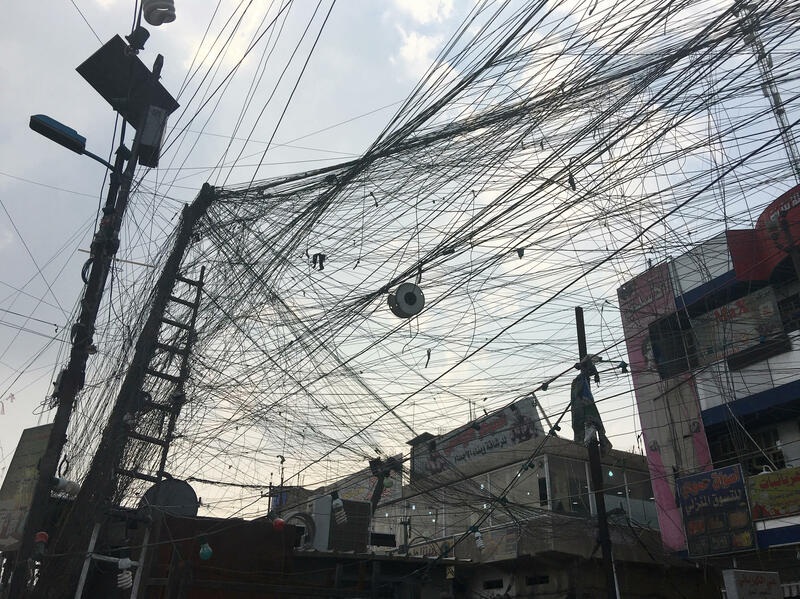 These electrical cables go to a private community generator. Residents who can afford it pay to run lines to it. An Iraqi woman holds the hand of two children as she walks past two U.S. soldiers after they briefly stopped a vehicle at an intersection in downtown Tikrit, north of Baghdad, on Nov. 10, 2003. Iraqis visit Baghdad's Al-Nakheel "Palm" Mall in 2015. 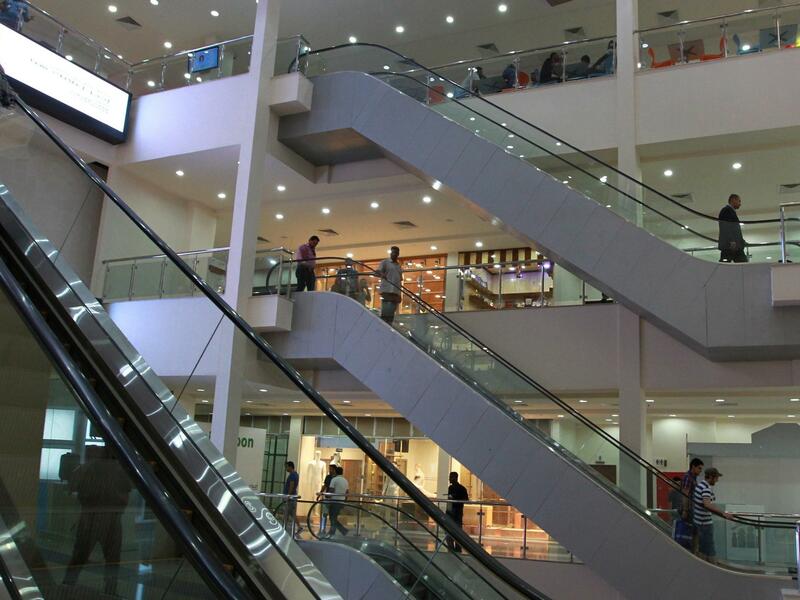 Despite damage in the city going back to 2003, gleaming shopping malls have opened in recent years. 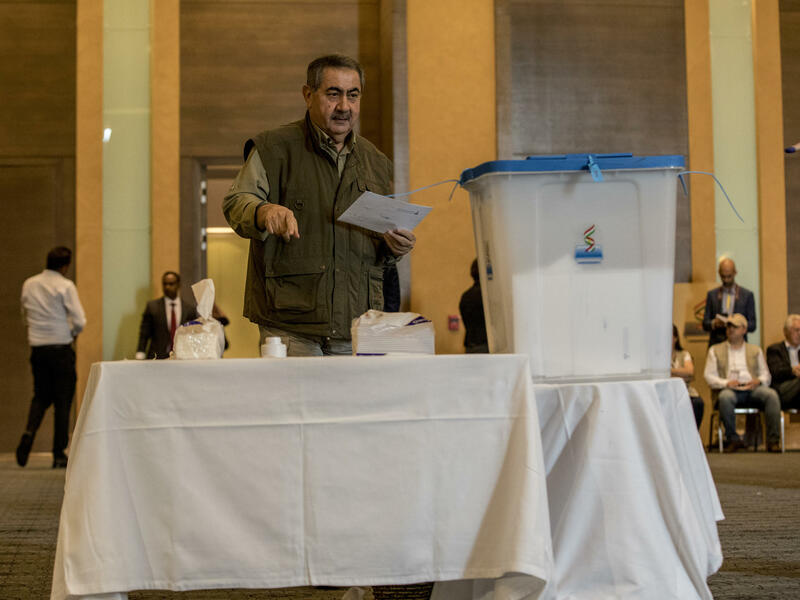 Hoshyar Zebari, former foreign minister of Iraq, casts his Kurdish independence referendum vote on Sept. 25, 2017, in Irbil. Zebari describes Iraq today as "broken." But he believes there is still a chance of fulfilling the promise and the possibilities many envisioned for postwar Iraq. Qathem Sherif al-Jabouri at his motorcycle repair shop in Baghdad. Even though the former powerlifter spent 11 years in prison when Iraq was ruled by Saddam Hussein, he now says the country was better off in those days. 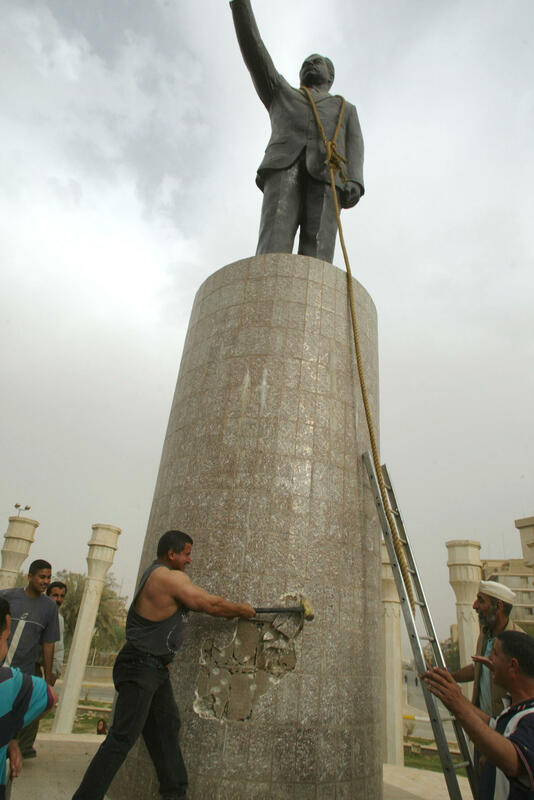 "Now, I really regret hitting the statue," says Qatham Sherif al-Jabouri, shown here on April 9, 2003, helping to topple a Saddam Hussein statue in Baghdad. The U.S. military formally ended its Iraq mission in 2011. But there are still more than 5,000 American troops in the country — most of them working with Iraqi forces. At Jabouri's headquarters, a U.S. surveillance blimp hovers in the sky, watching over the city liberated from ISIS last year. 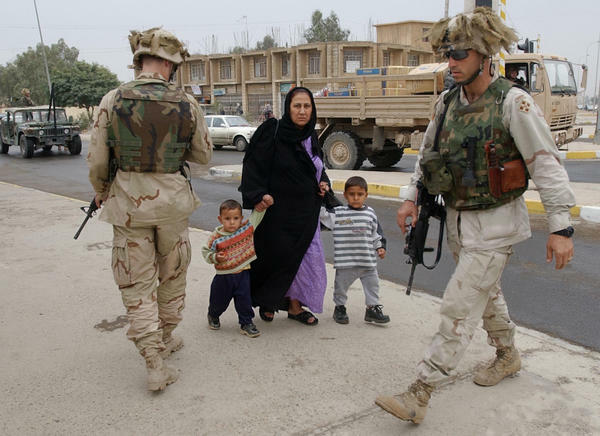 American soldiers wearing shorts and Army T-shirts jog down the road. 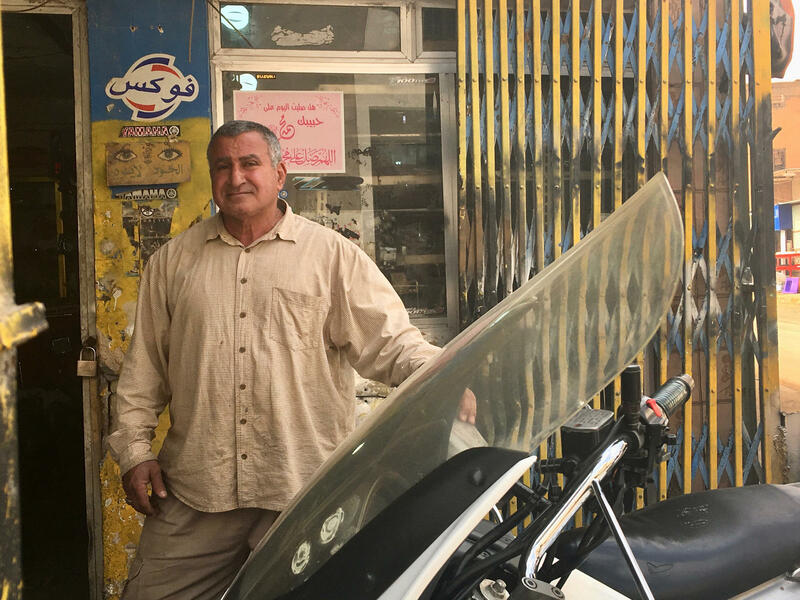 It's Wednesday — the day that Jabouri opens his doors to Mosul residents. In 2018, as in 2003, many Iraqis still turn to their military to solve their problems. Almost a year after ISIS was driven out of Mosul, the problems are immense and multilayered. One woman says her husband and 17 other relatives have been missing since they were arrested three years ago by a militia working with Iraqi security forces. "They arrested 18 men," she tearfully tells the commander. "Now in my family there are only women. We don't have any men." Others can't return to their homes because relatives joined ISIS and tribal leaders or local security authorities won't let them come back, or they're destitute and looking for jobs. For one elderly woman — who says she and her husband have been barred from returning because a grandson joined ISIS — Jabouri picks up the phone and asks the local commander to let them return. For others with missing relatives, he promises to check their names when the Interior Ministry provides a list of prisoners that he has been seeking for months. The poorest leave with boxes of food. Jabouri says in 2003, he had first thought that with Saddam gone and the Americans in charge, the new Iraq would be orderly, liberal and secular. "We thought we would breathe freedom, we would become like Europe," he says. Instead, he says, "We returned to the Dark Ages. It was very difficult to imagine that the United States would allow religious people to control Iraq." Iraq's American administrators, working with expatriate Iraqi leaders, allocated power along religious and ethnic lines. Iraq became the Arab world's first Shiite-led government in centuries. Many of the leading Shiite political figures were Iranian-backed. Some of the country's Sunni figures had ties to al-Qaida. Iraq devolved into one of the most dangerous and corrupt countries in the world. With an estimated 500,000 killed in war and violence since 2003, few families have been left untouched. Although security has improved immensely, corruption remains entrenched. "The majority of people before — Sunni and Shiite — did not like the regime," says Jabouri. "But many people, when they compare between the situation under Saddam Hussein and now, find maybe their life under Saddam Hussein was better." Jabouri was brought back into a new Iraqi army created by the U.S. after 2003. He worked closely with American forces when his troops fought in Tel Afar with Col. H.R. McMaster, who later served as national security adviser to President Trump. Jabouri went to the U.S. and studied at the Army War College. Four years ago, he returned to Iraq to help command the battle for Mosul. He says he is heartened: He believes Iraqis have learned the painful lesson that sectarianism tore the country apart. "I am optimistic about the future of Iraq," he says. "Maybe after 15 or 20 years, Iraq will change." With an iron grip and an oil-fueled economy, Saddam papered over the fault lines of one of the Arab world's most diverse countries. 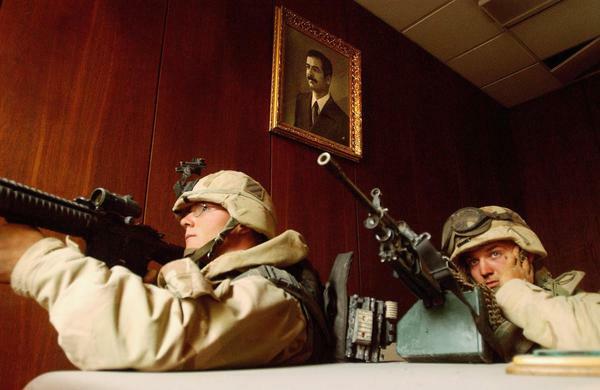 In 1991, after the U.S. drove Saddam's forces out of Kuwait, which Iraq had invaded, Iraqi Kurds broke away from central government control with the help of a U.S.-led no-fly zone. The Kurdistan region flourished after 2003 as the most stable and prosperous area in Iraq. Some of that has come tumbling down in the aftermath of a Kurdish referendum on independence. Iraq and its Kurdistan region are once again redefining their relationship. In the mountains near the Kurdish capital, Irbil, former Iraqi Foreign Minister Hoshyar Zebari sits by a crackling fire in the filtered light of early spring. Zebari, a Kurd, served as Iraq's top diplomat for 11 years, starting in 2003. He remembers having to convince young American soldiers manning the gate of Baghdad's Green Zone, the seat of government and U.S. military headquarters, that he was the foreign minister and needed to be let in. Zebari describes Iraq today as "broken." But he believes there is still a chance of fulfilling the promise and the possibilities many envisioned for postwar Iraq. "We had high hopes of having a new country based on the principle of democracy, on federalism, on human rights, on citizenship, on equality," he says. "That dream is still there but it has taken longer to realize. ... The one achievement is the constitution — it embodies those dreams." The country's postwar constitution, which Iraqi voters approved in 2005, lays out the foundation for a modern state, pledging to create a country "free from sectarianism, racism ... discrimination and exclusion." Zebari and others say the problem is that constitutional measures aren't implemented. After 15 years, the Green Zone and the politicians inside it have become almost irrelevant to most Iraqis. They have learned to live with the country's political chaos and government dysfunction. There are still visible remnants of the destruction from 2003. Buildings collapsed by airstrikes are left unrepaired. But without the nearly constant threat of car bombs that existed for almost a decade, neighborhoods have sprung up and thrived. Gleaming, glass-fronted shopping malls dominate the skyline in upscale parts of the city. 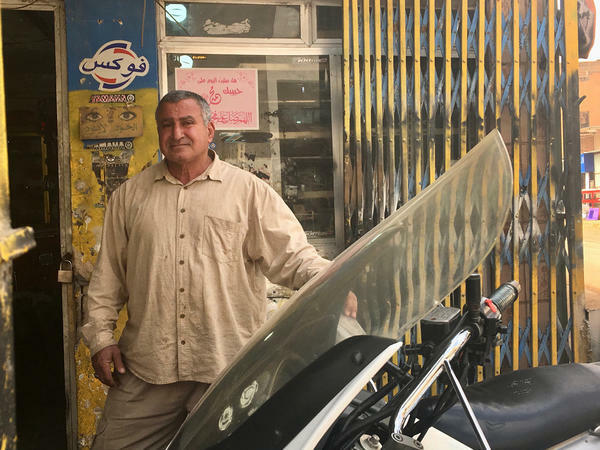 Near the square in central Baghdad where Saddam's statue was toppled in April 2003, Qatham Sherif al-Jabouri sits in his motorcycle repair shop and reflects on the role he played in Iraqi history. "I was in my garage close to the statue," says Jabouri, 60, who is not related to the general. "I had always had the idea that the day would come when I could hit the statue and topple it. When the Americans started to enter the city, I took the sledgehammer and I went to the statue and started hitting it." Jabouri was a champion powerlifter. In news footage at the time, his huge biceps bulge from a sleeveless shirt as he swings away at the concrete base of the statue. He says after U.S. Marines arrived, they helped bring down the statue with a truck. He says when one of them unwisely hoisted an American flag, he brought an Iraqi flag from the social club next door to replace it. "I was very happy because the danger and the dictatorship and the dictatorial regime were gone," Jabouri says. "We were happy to think there would be change for people, but then we were surprised." Jabouri had spent 11 years in prison under Saddam. His relatives were executed because they were Communists or members of the Shiite Dawa party. Now, though, he insists that life was better back then. No one can know what would have happened to Iraq had Saddam stayed in power. With that question unanswerable, many Iraqis look back at the death and destruction of the past 15 years, and in a haze of nostalgia for the stability of dictatorship, believe they would have been better off with Saddam. "Those who came after haven't improved the infrastructure, they haven't built anything, they haven't done anything for the people," says Jabouri. "Saddam's was a brutal regime. But now, I really regret hitting the statue."